We offer for Melbourne Base Clients Only. Water Features ‘R’ Us offer Pond maintenance and cleaning with the latest cleaning equipment serving Melbourne private clients, commercial sites and public/council areas to suit the feature individual requirements.Regular servicing of equipment ,pumps and filtration can prolong the life of your equipment and will keep your feature looking clean. With 20 years experience in the industry we can diagnose your leaking pond.The leak could be a small tear in your liner or a cracked concrete pond.We can repair or give you the advice on how to repair your leaking pond. 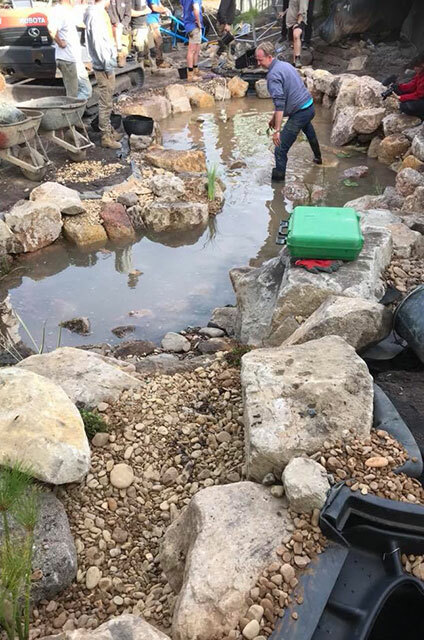 We can design and build you a natural pond or we can tailor a formal pond to suit your requirements.We specialize in revamps and refurbishing of your existing pond. We can install your new water feature if required.Also offer a Landscape service to suit your installation if required. 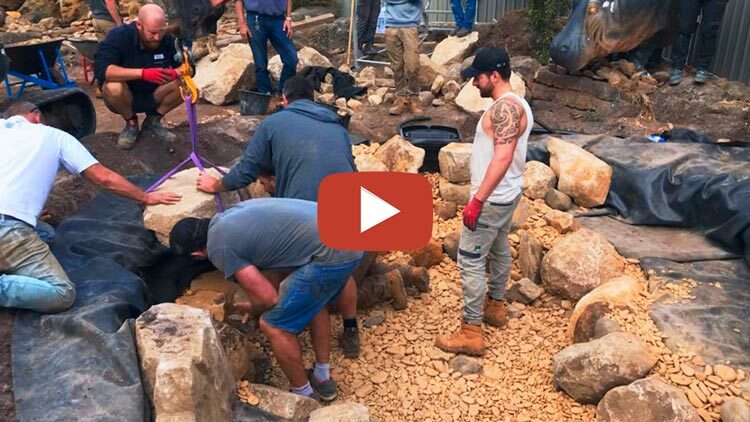 Pond construction is an exciting period for anyone who dreams of having a natural sanctuary in their backyard. As soon as the basin is set up, the plants potted and the fish are swimming happily around the custom made landscape, you are inclined to lay back, relax and enjoy the view. However, owning a pond requires regular upkeep, and if you spend too much time in your garden chair, the entire habitat will suffer. There is always something to do around the lively pool, whether you need seasonal pond cleaning or replacing parts and materials. If you don’t want it to become a tedious part-time job, you should consider approaching professional pond maintenance services. Numerous aquascaping companies offer pond maintenance services. Even the contractor that installed your pond may provide this type of work. Furthermore, you could try to negotiate a long-term upkeep contract before pond construction is complete. Cleaning the pond yourself can bring a pleasant feeling of pride and achievement. This regular practice should also give you a better idea of what goes on beneath the small pool in your background. It is a great way to remain active and learn more about the wonderful world of outdoor aquascaping. Nevertheless, professional pond maintenance services can provide you with a great number of benefits. First off, there is a good chance that pond cleaning will be done right and with virtually zero mishaps. Secondly, the trained eye of the builder can spot hard-to-find problems and prevent any possible damage before it occurs. Another advantage of leaving pond cleaning to the professionals is the time that you save. Amateur pond maintenance may take a full day, or even more if you tend to neglect regular upkeep. Instead of spending an entire weekend in your rubber boots, you can relax in your garden chair, enjoy your free time and even learn a few tricks by watching the contractors cleaning the small lake. With the right selection of pond maintenance packages, you can enjoy a full year of having a worry-free water habitat in your backyard. Contractors will ensure that your pond stays safe, that the water remains clean and that the fish are happy all year round. Professional pond cleaning services include high-quality upkeep for each season and urgent interventions in case of hazard situations. Each package comes with a complete set of pond cleaning services that guarantee fresh, sparkling water, debris removal, fish health assessment and defective parts replacement. Also, you can opt for seasonal shutdowns and complete overhauling of your water feature, even after the pond construction is complete. Pond owners expect spring with an almost unbearable enthusiasm. This is the right time of year to perform pond cleaning just as the entire ecosystem awakens from a lengthy hibernation. It is also the ideal moment to make sure that your pool will get off to a new start and reach optimal conditions by the time summer comes along. Pond maintenance experts recommend giving your pond a complete cleanout in spring. A good tidying up will reduce the amount of work that you will need to do during the hot summer months. If this is the first year as a pond owner, you might want to approach professional contractors that will make sure that your fish do not die from sudden temperature changes or stress. The warm season should be a time of little maintenance and restoration for pond keepers. In fact, if you have done a proper spring cleanout, then you have very little to worry about during the hot summer days. Still, you should consider professional pond maintenance if you are looking to spend a long vacation away from home. Regular interventions from a pond cleaning team can ensure that the level of healthy bacteria is high enough to sustain life in the water. Also, professionals can install additional water pumps that will enhance the amount of oxygen, which usually is at a low level in summer. The end of summer marks the time when most pond owners start preparing for the cold season. It is at this time of year that autumn leaves start to fall, and if you fail to gather them frequently, your pond maintenance work will increase to a daunting amount during next year’s spring cleanout. Your best choice for the matter of discarded foliage is to ask a pond maintenance contractor to install a net over the pool of water and diminish the amount of fallen debris. Cats and birds of prey are known for their increased activity during the autumn months. By adding netting to your pond you also protect your fish against predators or unwanted visitors. Fall is also the ideal season to install the necessary equipment for winter time, such as aerators, bubblers and de-icing machines. Since you already take out the pump for the season, you can commence the autumn shutdown, which will prepare the fish for hibernation and will reduce the pond maintenance work. Maintaining a clean pond in winter is easier than keeping the water in it from freezing. During this period the fish inside the pool are hibernating, and so are some of the plants. The pond is not much to look at, but it still requires proper upkeep. If you have chosen to shut down the entire system during the autumn days, you will only need to ensure that the pond is not completely frozen during the cold winter months. In this regard, you can keep a regular hole in the ice that provides safe oxygen levels for the fish – literally, a fresh breath of air at all times. Additionally, you will use this hole to feed the fish that are still active. You can contract professionals in pond maintenance to install a waterfall that will entertain a flux of fresh water into the pond. Also, it will make for a spectacular sight for the visiting family during the holidays. This water feature will require constant maintenance and checkups to ensure that the mix of cold water and warm streams do not stress the fish too much. When should I clean my pond? All ponds require minimal and periodic cleaning, regardless of size. After pond construction, the body of water will need very little upkeep in the beginning. However, in time you will need to pay more attention to the pond’s preservation. Seasonal maintenance services are highly recommended for maintaining the habitat in optimal conditions all year-round. What is the best season for pond cleaning? Provided that the entire system is properly installed, you can opt for early spring and late fall pond cleanings. These periods ensure that the fish will be less stressed and that the cool temperature will not produce damage to the plants or the fish. What happens to my fish while you are cleaning the pond? Pond cleaning professionals will set up a special tank at your location. They will fill this tank with some of the water from the pool and maintain it at an appropriate temperature during the entire process. The fish will stay in this tank until the pond is cleaned and ready to receive them. This practice prevents the fish from experiencing stress. Is there a guarantee to pond maintenance? All work provided through professional pond cleaning services is guaranteed. Furthermore, any part that is replaced or repaired comes with an extended guarantee certificate that is in accordance with the manufacturer or the contractor.